Perhaps surprisingly, the most recent comprehensive survey of fox numbers on the Crown Lands of the New Forest dates back to 1974 - Hugh Insley, who was a Forestry Commission, District Officer in the 1970s, instigated an intensive survey of foxes' earths containing cubs, which was carried out by the local keepers. Based on their findings, he estimated a population density of 0.75 foxes per square kilometre, which gave an overall population of around 200 adults on the Crown Lands' 270, or so, square kilometres. What allowance, if any, was made for occupied earths that were not detected, the inevitable interchange of foxes between the Crown Lands and nearby private lands, and the presence of non-breeding animals, such as barren vixens and itinerant foxes, is, however, unknown. (Data from Lloyd (1980) suggested that in Britain, on average about 25% of vixens are barren, whilst a population estimate produced by Harris et al in 2005 assumed that there were a further 0.5 itinerants per family group of adult male and breeding female). The New Forest population density of 0.75 animals per square kilometre is, however, considerably lower than in many places elsewhere - the New Forest provides poorer opportunities for food as, for example, there are relatively fewer small mammals due to a lack of ground cover caused by intensive grazing by deer and commoners' stock; and earthworms (surprisingly regularly eaten by foxes elsewhere) are not particularly abundant in the Forest's primarily acid soils. (Recent research by the Department for Environment, Food and Rural Affairs (DEFRA), based on records collected up to 2013, suggested population densities in the wider countryside of 1.94 foxes per square kilometre in broad-leaved woodland, 1.57 in coniferous woodland, 2.31 in rough grassland and 0.98 in heather. And in many towns and cities, population density is hugely higher - Bournemouth apparently heads the league for the most foxes per square kilometre with an incredible tally of 23). Today's (2017) New Forest fox population is believed to be broadly similar to that of 1974, despite more competition for food from increased numbers of buzzards and goshawks, and despite the cessation in 2005 of hunting with hounds. (Official Forestry Commission figures show that in the 1997 / 1998 New Forest fox hunting season, for example, two hunts were issued with licenses, 28 fox hunts took place and 33 foxes were killed during fox hunts; but research elsewhere suggests that hunting has little impact on overall fox numbers). Trail hunting continues locally and some foxes are probably occasionally caught up in the process, but far fewer than previously are now killed during hunts. 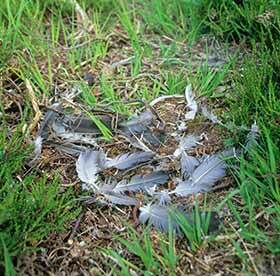 Nationally, though, many more are probably shot, trapped and killed in other ways - even the RSPB, for example, admits to having killed 412 foxes on 28 reserves between 1st April 2014 and 31st August, 2015 so as to protect ground nesting birds. New Forest keepers, however, do not systematically control fox numbers - foxes do not threaten forestry interests and are therefore not part of the Forestry Commission's wildlife management programme, nor are they perceived as a threat to the overall population levels of any of their prey species, even though they do predate the nests of ground nesting birds. 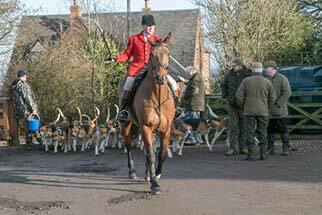 Some New Forest keepers may, though, occasionally kill foxes on the Crown Lands where a specific problem has been identified. To sum up, then, foxes are reasonably widespread on the Crown Lands of the New Forest, although reliable information about current fox population levels is hard to come by; so without doubt, there is much potential for further research. Local fox population levels have not always been stable. The population in the 1780s, for example, is known to have been at a very low ebb when uncontrolled hunting by a number of fox-hound packs was intense. Better regulation of visiting packs followed, and fox numbers, at least to some extent, recovered. Subsequently, for the first 80 years of the 19th century, the fox record books are largely silent, although the shooting diaries of Colonel Peter Hawker provide circumstantial evidence from other parts of Hampshire and, in particular, from the coastal area around Keyhaven and the Test valley at Longparish, where Hawker had homes. The Colonel’s diaries cover the period from 1802 until his death in 1853, and exhaustively record details of shooting forays during which just about anything that moved was taken. Large bags of pheasants, partridges and waterfowl regularly feature, and hares and rabbits, too, yet there is no reference at all to foxes. Does this suggest an absence of foxes? It seems highly likely, or at the very least, fox presence only in very small numbers, unless, of course, the Colonel reserved his notes only for things that could be eaten! More details of numbers are available for the period between 1880 and 1914 when Gerald Lascelles was Deputy Surveyor of the New Forest. Lascelles was a keen fox hunting man and also a meticulous note-taker. As Deputy Surveyor, he was also responsible for ensuring that foxes were available for the hunt. Lascelles reported with pride that during his period in office, ‘the supply of wild foxes did not fail’ and that by 1914, when he retired, there was ‘as fine a show of foxes in the New Forest as the country had ever produced’. But whilst the fears for a while proved largely unfounded, the naturalist Brian Vesey-Fitzgerald in his 1960s book Town Fox, Country Fox noted that in 1914, a large-scale fox mange outbreak started in the New Forest and spread with decimating effect eastwards as far as the Kent coast – this, presumably, was shortly after Lascelles left the area, or maybe he just conveniently omitted reference. 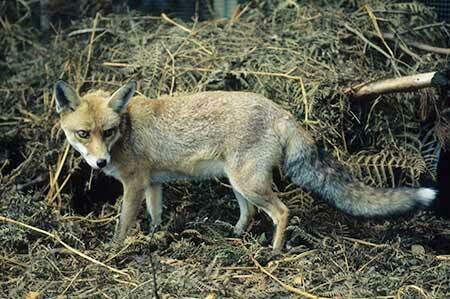 In many parts of 19th century Britain, foxes were relatively scarce. In fact, until 1914, foxes were imported from abroad for the benefit of the hunt, and transported to final destinations using the burgeoning railway system. The Reverend Francis Kilvert, for example, writing in 1873 about the Radnorshire and West Herefordshire Fox-hounds refers to a ‘bag fox’, that is, a fox deliberately released into the countryside to be hunted – the fox was ‘kept in a darkened cellar so long that he was dazed and half-blind when he was turned out’ to be hunted. Fox imports ceased with the outbreak of the First World War, and never, as far as is known, resumed. Then, the country had far higher priorities than fox hunting and gamekeeping, which allowed fox numbers to recover. (The same effect was noticed during the Second World War, when numbers also apparently greatly increased). More recently, modelling by the Department for Environment, Food and Rural Affairs (DEFRA) suggested that in 2013, Britain had 430,515 foxes, although their report does make clear that, given uncertainties associated with the earlier estimates and their own estimate, the fox population may not have increased at all since the 1995 report. Similarly, the New Scientist in 2017 reported a UK increase in urban fox numbers to a massive 150,000, although this estimate is qualified by uncertainties associated with the research methodology and data analysis.